His sire is the famous stallion Mensaje Del Ocho. Mensaje del Ocho is one of the best sons of Nevado and a proven producer. During his career he was able to obtain the following placements and titles: Gran Campeon, Conguas, P.R. 1992, Campeon Reservado 3er Show Internacional, Ponce P.R. 1991, Gran Campeon, Barquisimeto Venezuela 1991, Gran Campeon, Coro, Venezuela 1990, Gran Campeon Fuerte Tiuna, Venezuela 1990, Gran Campeon Barquisimeto, Venezuela 1990, and Gran Campeon, Feria la Dorada, Columbia 1989. .
Fourth Grand National Performance Gelding Champion in the 2005 Paso Fino Grand National Championship Show in Perry, Georgia. Third Place Four Year Old Performance Geldings in the 2005 Paso Fino Grand National Championship Show in Perry, Georgia. Fifth Place Four Year Old Pleasure Geldings in the 2005 Paso Fino Grand National Championship Show in Perry, Georgia. 2005 Spectrum International Reserve Champion Performance Geldings. Competed and placed highly throughout the 2005 show year in the Professional Four Year Old Performance and Pleasure Colt & Geldings Classes. 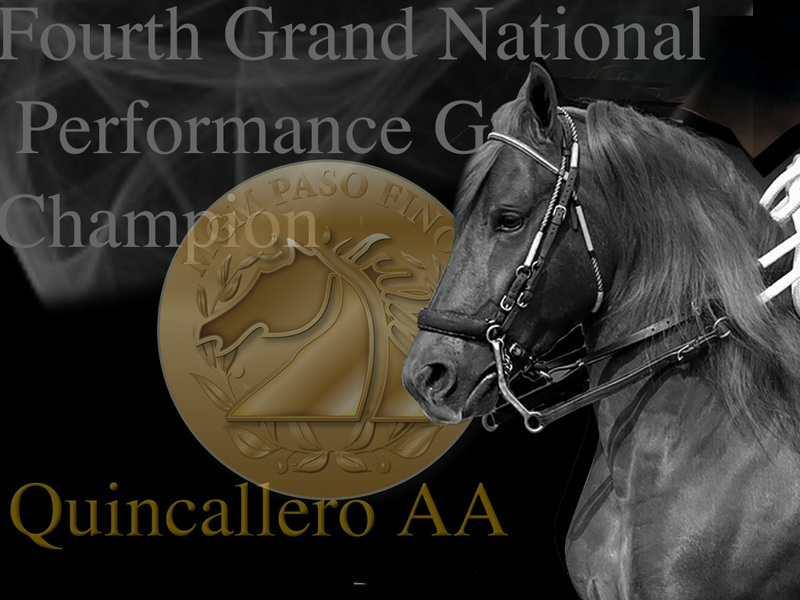 Competed and placed numerous times in the Sub-Junior Youth Performance and Pleasure Classes during the 2005 show season.